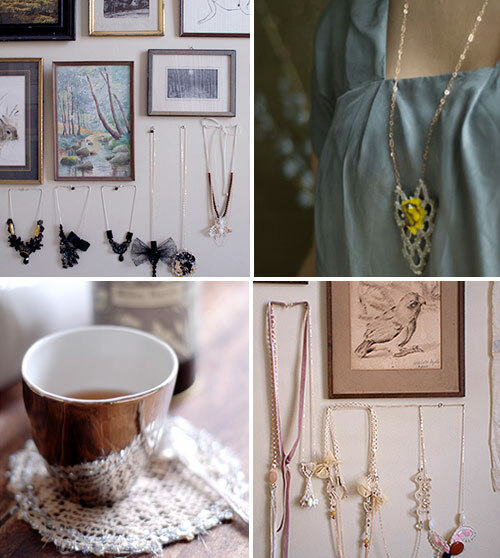 Some charming interiors, and close up of home things. I'm really happy because we were finally able to book tickets to get home! I've been extremely home sick, and I'm just really happy to be able to go home, 1 more week!! :) And these are also inspiration for me, when I get back home.. I plan on redecorating/rearranging my room, and my sewing area!! How crazy is it that its August already? I gotta start preparing for my last year of school, yay! So excited about that too.. I love these shots; great inspiration for a one-day apartment, I hope! (Looking back to see her own room). OK... maybe I might need to re-organize my room too. I love the way the jewelry is organized, Glad you're going home - where is that for you? p.s. Chelsea's gown was indeed lovely wasn't it? Have a good week and hope to see you around blogland soon! i love how theres a perfect place for everything! First of all, I adore your header. It's so boss. Secondly, I love these pictures. They are exactly what I want my future home to be like--quirky and fun. I know, I can't believe we're already in August! Ah, I am totally loving all the unique ways to store/hang jewelry. My necklaces are literally tangled up all over my desk; I need to definitely invest in some better storage devices. Necklaces on the wall?... why not, they look great! Congrats on going home soon! I get homesick too. I Just love that first photo. I love that everything has its place. Yeah can't believe we're in august already.. 4 months to go and we're in 2011!! Very inspirational! Love the last pic especially! We're also in the middle of re-decoration our home, so much fun!! I would love my sewing/crafting area to look like the last picture! Great images!!! I'm loving the necklace on the mannequin with the blue shirt...it's gorgeous. Why you are learning about Mario Testino? Do you study Photograp..or something similar? Love the last picy! I might take some pictures of my flat myself for my blog! Thanks for your comment :-) you now have a new follower. I might even include you in my favourite blogs list. If that's cool with you of course! I LOVE these interiors. Im moving into my own apartment too so Im ready to drop money on some stuff I don't need! I love the little things! great post! I love organized inspiration. These are all lovely. My fave photo is the first one! Things like this make me want to re-vamp my room! Love this post! Great selection of photos.